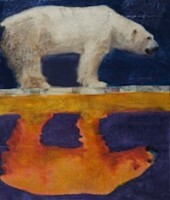 Check out Douglas E Taylor’s gorgeous giclée print, Solar Bears II: Polar bear on thin ice. Taylor, a local Montana artist, created this mixed media image exclusively for the Great Bear Foundation’s 2010 International Multicultural Bear Honoring. Taylor’s artwork reflects his strong spiritual connection to the natural world. Solar Bear II (polar bear on thin ice) and another image, Solar Bear I (polar bear in hot water) were created through inspiration from The Great Bear Foundation and Chuck Jonkel. The images and titles are obvious editorials of the precarious position the great polar bears are experiencing because of global warming and the rapid changes in their natural habitat. The polar regions are not a common experience for a majority of the Earth’s human population, yet we do seem to have an effect on the far reaches of our planet. Science has proven our various environmental impacts on this garden in space and the many life forms that call it home. All of my work is about the power of the individual and how we can never really limit how far our influence may reach. There is a responsibility when achieving so much power. I believe we must be conscious of that influence. People like Chuck Jonkel, his staff and supporters of The Great Bear Foundation are good examples of a small number of people making a difference and creating awareness and honor for those great bears and their natural environments. During a meeting with Chuck, I wrote down something he said, “What kind of bear is on the other side of hope.” These mixed media images were created, utilizing my own photography of captive polar bears, combined with painting and printmaking.